Customers often ask me which 8×42 binocular has better light-gathering capability: Brand X or Brand Y. The fact is that all 42-mm objective lenses have the same light-gathering capacity. The difference in brightness between binoculars is their ability to get the light from the objective back to your eyes. If the glass quality of the lenses and prisms is the same, any observed difference is attributable to the coatings. When light is transmitted through a lens, some light reflects off its surface and is lost. 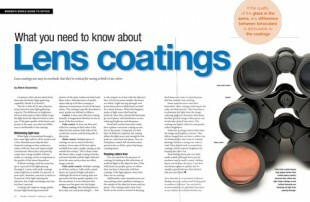 Manufacturers deposit thin chemical coatings on lens surfaces to reduce reflective loss and improve light transmission. Binoculars and spotting scopes have a large number of lenses inside, so coatings can be as important as the quality of the lenses themselves. Without coatings, each lens may lose up to 5 percent of the light passing through it. Lenses with multi-coatings reduce light loss to tenths of a percent. A poor optic, therefore, may lose as much as 35 percent of the light entering the objective, but a high-end design may lose less than 5 percent. Coated. A thin anti-reflective coating (usually of magnesium fluorite) on one or more of the lens surfaces. Fully coated. At least one thin anti-reflective coating on both sides of the objective lens system, both sides of the ocular lens system, and the long side of the prism. Multi-coated. Multiple layers of coatings on one or more of the lens surfaces. Even some of the best optics available have only a single coating on the outside lens surface. This is done under the theory that a single coating is harder and more durable and the light reflected from the outer surface does not affect image contrast. Fully multi-coated. Multiple coatings on all lens surfaces. Fully multi-coated lenses are typical of high-end optics. Although this level of coating does not guarantee the best quality (quality is in the execution), it is an indicator that greater care has gone into the design. Phase coating. Most birding binoculars today are roof-prism designs – that is, the eyepiece is in line with the objective lens. (On Porro prism models, the lenses are offset.) Light moving through roof-prism binoculars is folded back on itself for a short distance. When this happens, peaks of light waves that lined up perfectly when they entered the binocular go out of phase, and interference occurs, reducing brightness and sharpness. Most bird-worthy binoculars today have a phase-correction coating on one face of the prism. Composed of a thin layer of dielectric material, the coating delays the light waves just enough for the peaks to come back into phase. You can find phase-coated, full-size binoculars priced as low as $140, a price that keeps creeping lower. You can check for the presence of coatings by looking at the reflections of artificial light in the objective lens. If the reflections are purple, green, or yellow, then you have a binocular with lens coatings. If the light appears clear, then there are no coatings. Additionally, some manufacturers are now putting water-repellant coatings on the outside of the objective lenses and eyepieces. The coatings make water form beads on the surfaces instead of sheeting. Such lenses are easier to clean because dirt has a harder time sticking. Some manufacturers tout their binoculars’ ruby coatings (referring to the color, not the mineral). Their function is to eliminate red light from the image, reducing apparent chromatic aberration, but they give the image a blue-green cast. Avoid ruby-coated binoculars. The coatings are highly reflective and greatly reduce brightness. Some lens coatings remove blue from the image and heighten contrast. They deliver images that can have a yellow tint. For birdwatchers who want to evaluate plumage, however, seeing true color is vital. They should stick to neutral lens coatings, which improve brightness by keeping the color true. Most birding binoculars are fully multi-coated, although lower-priced products may be multi-coated. Adding layers can increase the price. Cost does not always equate to quality, but it’s usually a good indicator. Buy the best that you can afford. Steve Sosensky is vice president of Optics4Birding.com and a professional birding guide in southern California.